The Focus RS has for years been only available in Europe but Ford finally changed all that with the newest iteration. Still, the hot hatch is incredibly popular over in the Old World, as evidenced by the pre-sale numbers coming out of the United Kingdom. A total of 1,500 orders have already been placed, with a whopping one-third of those orders coming before pricing (£28,940 or $44,745) was announced. Ordering a car before knowing its price may sounds nuts but not if you’re a brand loyalist. 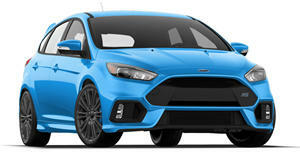 Andy Barratt, Ford of Britain chairman and managing director, told Autocar that many pre-orders came from those who had previously owned a Focus RS. He also shed light on the options those in the UK are selecting. “We expected those first in the queue to be exacting about their requirements, and so it has proved, with many opting for motorsport-style Recaro shell front seats, 19in black forged alloy wheels, Luxury pack, electric tilt/side sunroof and Ford SYNC2 navigation and sound system.” It remains to be seen what type of options Americans will tick off and how many will line up to be the first to own the hot hatch. Remember the UK’s enthusiasm is due in part to its long history with the Focus RS. Americans have been demanding the hot hatch come stateside for some time now, so it’s hard to imagine order sheets going unfilled with the 350-horsepower base model starting at $35,730. That being said the fully optioned model, which has the same power and comes in at $42,275, may not prove so popular.